Last weekend, our daughter's softball game was interrupted due to a tornado warning. Rather than book it back to our mobile home, we decided to weather this one out at our house site. Our brick pizza oven was still warm from the night before, so we heated up leftovers and listened to the radio for weather updates. 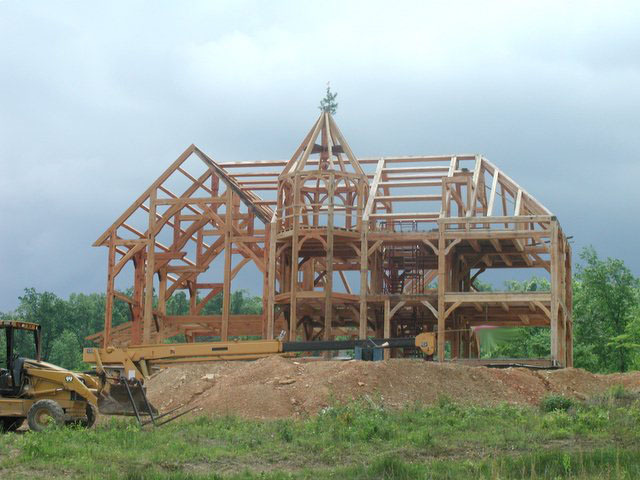 In spite of strong winds and driving rain, things were calm and cozy inside our timberframe. Our peace and quiet was interrupted though when giant hail started slamming the steel garage doors on the north side of our house. We soon retreated to the basement ! While studying a clumpy ball of hail about the size of my fist (and pondering the condition of our solar panels), I watched a 100 plus foot oak tree slam into the stone pile in our front yard. Four more trees of that size fell within seconds, but I didn't get to see them, because I was herding our family away from the windows and into the storm room that adjoins our basement. Torrential rain accompanied the winds, such that all of the runoff from the roof (we don't have gutters yet) was blown against the house walls and ran down behind the unfinished stonework and into the basement. When the greatest danger passed, we emerged from the storm room to place buckets where water was running past the sill plate. And as soon as the rain subsided we walked upstairs and looked out our windows to find 80 to 100 year old oak trees laying in our front yard and across our driveway. Fortunately, the tree damage was limited to the vicinity of our house -- very few trees fell elsewhere on our farm this time. Still though, the uprooted trees were eerily reminiscent of those that came down in the 2003 ice storm and supplied all of the timbers for our house. By comparison, this week's storm was insignificant... providing only 17 loader buckets of firewood and 12 large logs (for our porch timbers perhaps?). It's brutally hot and humid here in Kentucky now, which makes it an odd time to be discussing radiant heat, but I'd like to describe the final details of our radiant floors as we implement them. I fired up the system this past winter and it worked great for heating the house and keeping our feet warm. In fact, the home-made aluminum transfer plates (10 to 15 cents apiece thank you!) were so effective that when we walked on the floors, we could feel exactly where the plates were located. But because we hadn't installed our ceilings yet, we had a lot of misdirected heat. The radiant tubing in the first floor inadvertently heated the basement, and the radiant tubing in the second floor made for hot heads on the first level of the house (with heat coming from the ceiling, it felt like talking on a 1990's cell phone for 2 hours). Before installing our finish ceilings, I took precautions to ensure that very little of our heat gets misdirected in our finished house. In the middle of the photograph, you can see a layer of heavy aluminum foil stapled beneath the floor joists, but above the tongue and groove ceilings. This foil is made specifically for reflecting radiant heat and can be bought on the internet or at a box store. (We found ours at Lowes.) Even though a lot of web sites say that kitchen aluminum foil won't work, I'd bet that it would work. But the purpose-built stuff is better if for no other reason than it has "scrim" or fiber embedded in it and therefore does not tear easily. Because I was working alone, I used a few ceiling boards to hold up the aluminum foil while I was stapling it up. Well, that's it. Rinse and repeat.